I've been a long time fan of the Tesla Model S and love the whole idea behind Tesla's retail model and company philosophy but there was no way I could justify stumping up so much money for a car. Yes, it's an amazing car, but waaaay too expensive for me. Not anymore. The Model 3 looks good and sounds like it's going to be a great car so I've done it; I've stumped up my £1000 refundable reservation fee and reserved myself a Model 3. 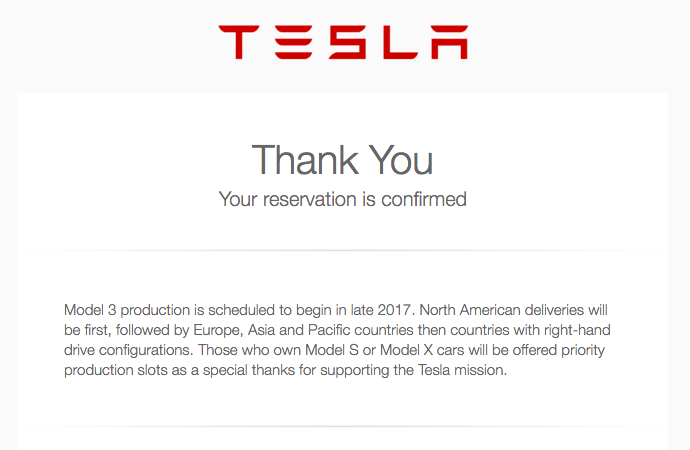 Delivery isn't expected until late 2017 and given the number of orders mentioned by Elon Musk on Twitter, I suspect it may only be sometime in 2018 that I'll get mine so there's plenty of time to save up for it.